Back home again and enjoying the deck! However, it seems we have interrupted the lives of our sometimes guests, the deer herd. It’s almost laughable, since we had deer around us at St. Andrews and wandering through the campsite at Manatee Springs. 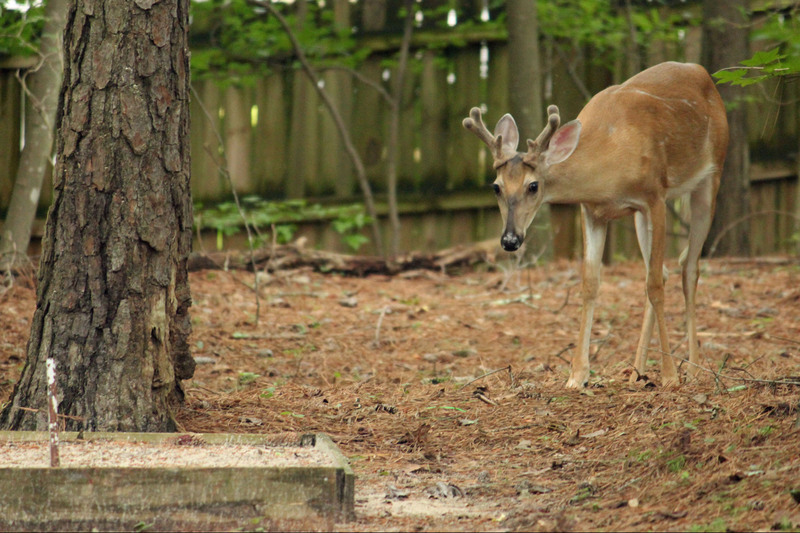 Now at home we had three roaming the yard, one young buck now in velvet, looking at us as the intruders. These must be last year’s fawns. Mother doe checked in next door with the single fawn, now about a month old, and the twin fawns appeared on the other side, also greeted by mom and taken off for a stroll. Will post some pictures soon for those of you who haven’t seen any deer lately. The new twins beyond the fence. Great news today! My Fitbit arrived. I have to say that the company was very responsive and prompt once they got a copy of my receipt. It was a simple process to replace the device without any loss in history. Nicely done, Fitbit! Not so nicely done was my request for an electronic receipt from Kohls from the road. Somehow they claim not to have a record of individual receipts other than at the local store. That was no help (Fitbit was purchased at Kohls). It’s ok, back to counting steps, and no tan line on my wrist!